So you have this dream. You buy an old Land Rover that has been asleep in a barn for a few years, tow it home and, over a few months, you bring it back to life. Looking at the prices being achieved at auction for 'barn find' restoration projects, you are not alone. Every year there must be hundreds, even thousands of old Land Rovers dug up from their last resting place and transported to a new home and (perhaps) a new life. Equally, a quick scan through Ebay will turn up plenty of abandoned restoration projects. "All hard work done, just needs finishing" seems to be the most common selling pitch. Far more restorations are started than are ever finished, and sadly a fair few of these project vehicles, having once escaped the scrap man, end up being broken anyway as their would-be saviour desperately tries to recoup some of the thousands of pounds he has spent on parts for a vehicle which he now realises, will never, ever be finished. I have broken half a dozen abandoned projects, always made good money out of them, and wish I could get hold of more. So how do you avoid ending up in this position? There are lots of things you need to consider before taking on a project. Do you have the time, space, equipment and basic skills to do the job? Will your better half put up with you spending hours out in the garage working on 'that old heap' rather than redecorating the spare bedroom which you promised to do three years ago? Will your finances stretch to cover the inevitable cost increases as you discover that the engine block is frost-cracked, the gearbox will select every gear except top and the bulkhead has more glassfibre in it than a Reliant Robin? Are you disciplined enough to dismantle the vehicle in an organised fashion, making notes and labelling parts as you go, or will you just pull the whole thing apart, throw the bits into old cardboard boxes and find, six months later, that you can't remember how it all goes back together? All these are reasons why projects fail, and you need to be really honest with yourself before getting into something that you might come to regret or even hate. So let's assume you are in a position to restore a Land Rover and stand a good chance of actually getting it finished and running. At this point the most important thing is to choose the right vehicle as a basis for your project. It amazes me how many people start by finding an abandoned Land Rover and then decide that they will carry out a full restoration on that particular vehicle. That is entirely the wrong way round and almost bound to lead to trouble. For restoration projects exactly the same rules apply as for any other vehicle purchase. Don't rush out and buy the first one you see, keep your options as open as possible and above all, DO NOT FALL IN LOVE WITH THE VEHICLE. 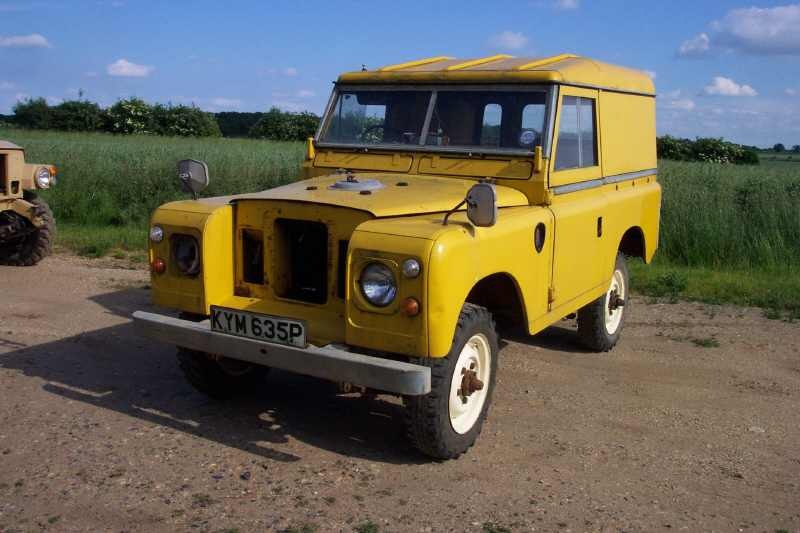 Of course if your whole motivation is to restore Grandad's old Series One that he bought new in 1952 and you learned to drive in, none of the above applies, but if you just fancy restoring 'an old Land Rover' do yourself a favour and pick the right vehicle to start with. So what are you looking for? Firstly, completeness. Ideally you want a vehicle that is all in one piece with no significant bits missing. Even apparently minor items can be very hard to source, especially on Series Ones and early Twos which are now more than half a century old. Avoid like the plague vehicles that have been partly or completely dismantled. You have no idea whether all the parts are there, and unless you have already rebuilt one of these vehicles you will have a whole lot of fun trying to work out which bits fit where. There are thousands of incorrect ways to assemble a Land Rover but only one correct one. If you try and guess how it all goes together, you will almost certainly guess wrong. I had a recently-rebuilt Series 3 turn up in the workshop with the shock absorbers mounted upside-down. It did not ride well. Secondly, originality. Ideally you want a vehicle as unmolested as possible, and largely as it left the factory. This will save you the joy of trying to pick apart incomprehensible bodges made by previous owners. It also helps if the vehicle you are working on resembles, at least in major respects, the one in the workshop manual. All-original vehicles are an absolute joy to restore, and the finished result will be far more authentic (and worth far more) than a 'bitsa' assembled from the best parts of ten or fifteen different vehicles. Thirdly, structural soundness. Many restorations start with a new galvanised chassis, and if this is the route you want to go down then the condition of the chassis is unimportant. But if you have not budgeted for a new chassis, best check that the vehicle doesn't need one. Bulkhead condition is absolutely crucial - new bulkheads are in short supply and very expensive indeed. Series One bulkheads are especially rot prone, difficult to restore and good replacements are almost impossible to find. There will almost certainly be some rot. Holes in footwells - easily fixed. Rotten door pillars - trickier but not fatal. Serious rot along the top rail, round the fresh air vents or in the top inner corners - game over unless you are a welding genius or know someone who is. Even then, a bulkhead that rotten will have plenty more rot in places you can't see or get to. Fourthly, consider very carefully the condition of the rear body tub. Good straight tubs, especially for Series vehicles, are like hens' teeth. The tub is spot-welded aluminium which you will not be able to recreate using the MIG welder you bought from Aldi. It is possible to replace the wing skins using specialist panel adhesive (Sikaflex) and pop rivets, but it isn't easy to keep the whole thing straight, or maintain the original strength. Holes in the floor are less of a problem, and the rear panels are much easier to replace than the sides, but a really battered, corroded and torn body tub will leave you hunting around for a better replacement, and you may need to look for some time. Fifthly, mechanical condition. People do not just stick old Land Rovers in barns for no good reason. If a vehicle has been taken out of use and dumped, it is usually either because the chassis has rotted beyond repair, or because the vehicle has a major mechanical fault. Bear in mind also that an abandoned Land Rover is unlikely to have received much maintenance in the couple of years before it was taken out of use. Expect all the mechanicals to be worn out and budget accordingly - anything less is a bonus. The good news is that it is all fixable (at a price). Finally beware of taking on a five door 109 or 110 Station Wagon as a first project. They are magnificent, stately old beasts but pose some challenges not found on lesser vehicles. The main problem is that they have a fair bit of steel in the body structure (side frames, underfloor crossmembers). This rusts badly in itself and also corrodes the aluminium where the two metals meet. Putting right a rotten Station Wagon body can become a very expensive pastime. The second row doors also corrode badly and are not cheap to replace. There are plenty of people out there who have restored a Station Wagon successfully, but unless you really need one, I would advise you to choose something simpler for your first restoration. Good luck with the project! One last tip: buy a cheap digital camera and take lots of photos during the dismantling process. You will find this a great help.